“Dear Miss Victoria, First of all, let me say that I am a HUGE fan of your work….” I got an email from Garth Brooks, and that's how it started. What ensued was a back-and-forth email dialogue with one of the classiest, kindest artists in country music. He sent me updates on how the song was sounding. He told me how much he hoped I was going to like it. He even sent me photos of his studio crammed to the gills with a huge orchestra he had flown to Nashville from L.A. to play on it. Then one day I answered my phone to hear his voice on the other end, inviting me to the studio to hear how the tracks sounded so far. I guess you could call the experience bittersweet. After all, Garth couldn't finish the song in time to release it on his current CD. He told me it will find a home on a future project...and he's been known to hold onto songs like that so I wouldn't be surprised if it did...but still, there’s no big moment of resolution here and there may never be. But I'm inclined to call it amazing. I got to sit face-to-face with one of the most iconic artists in history, discussing songwriting and recording techniques. I got to sit at his studio sound board and listen - with tears in my eyes - to the voice I recognized so well singing over an entire orchestra playing the notes I had written, while he waited to see what my reaction would be. 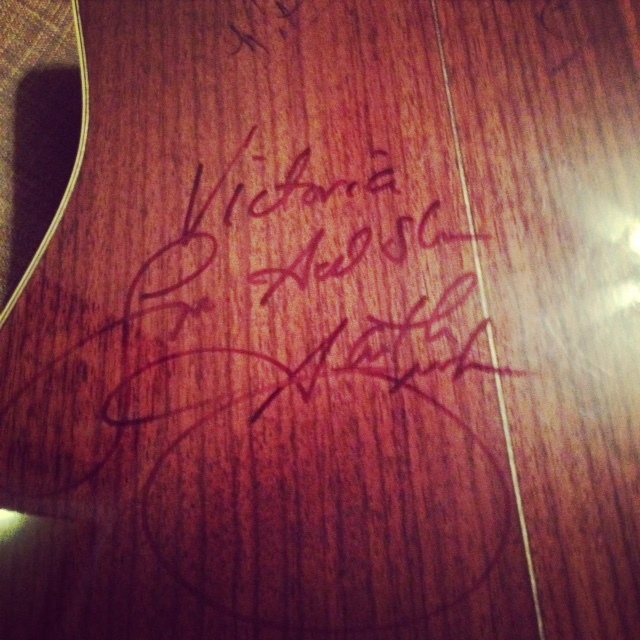 I got him to autograph the old, worn out guitar that I wrote the song on. He turned it around in his hands and strummed a few chords on it before signing his name on it with a black Sharpie pen. Garth was still in sweats and a wool cap, and he was due to walk the red carpet at the CMA awards in 20 minutes (“my wife has been in the hairstylist’s chair for 3 hours, and look at me – I’m a mess!” he joked). But he still took the time to walk me out through the front door, stand in the pouring rain, shake my hand, and tell me again that he was a huge fan of my writing. “LIKEWISE!”, I said. I mean, what can you say to that? When you start your career as a songwriter, you imagine the big moments in your life. You picture having massive hits coming through the radio dial…standing on stage holding trophies…but in the end, those aren’t the biggest moments. The biggest moments aren’t that glamorous at all. Sometimes, they’re just moments that come and go, in a nondescript building on Music Row. Those are the moments that matter.